Moving is stressful. It can seem like there’s just too much to take care of, and no possible way to organize it. But we’ve all been there before, and trust us, you can get through it. Take a step back, survey the house in front of you, and concentrate on what we call the 4 Ps of moving. You’ll pack up well, move things right, and settle into your new place with a big smile. It’s important to take your time and not rush at any point during your packing and moving. Even if challenges pop up, just keep going and don’t waste too much time worrying about something. Patience will help you stay as stress-free as possible. Tip: Take it slow. Pack one room at a time, organizing by item and size. Label your boxes with their contents and the room they’ll be moved into. Use colour-coding if you can—this will let you easily match boxes to rooms, making unpacking an easy affair. Create a plan of action with your packing and moving team—whether that’s family and friends or a professional moving company. Develop a moving timeline to track which services need to be cancelled or changed over, note which rooms can be packed well in advance, and point out which items should be packed up only at the last minute. Tip: Keep track of everything. Grab a clipboard with some paper and make a master list for yourself. Number every box, taking note of its general contents and destination (and its colour if you used one!). It may sound like overkill, but it makes things a total breeze in the end. Get instant access to our FREE Moving Timeline Printable Checklist—and stay up-to-date on all the great content and products we have to offer! Once you know what you’ve got to pack (and how much of it), it’s time to buy the moving supplies you need. Moving boxes, packing tape, bubble cushion and packing paper are the staples you’ll want to grab. Markers and labels will help you stay organized and on track as well. Tip: Don’t know where to start? 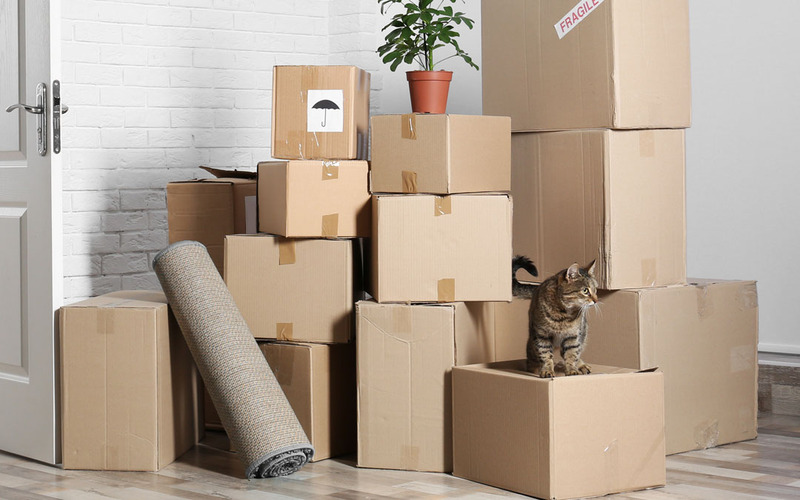 A Moving Starter Kit will get your packing party going! Unscrew any removeable legs and put them in zip bags with their matching hardware. Stretch wrap any drawers and movable areas closed, then wrap larger or more valuable furniture in moving blankets. Use mattress bags for protecting your mattress and foundation. Dismantle the bed, wrapping up headboards and footboards in moving blankets. Secure the bedrails into a bundle using stretch wrap, putting any screws or nails into zip bags, and securing them to the rails with more wrap. Layer the bottom of a box with bubble cushion or packing paper. Wrap each piece individually and place them inside the box upside down (not on their sides). Create layers separated by bubble cushion or dividers, and make sure you fill up the empty spaces. Each plate should be wrapped on its own and then bundled into sets of 2 to 3 plates. Stand each bundle on its end—never lay them flat—and place bundles next to each other. Don’t forget to fill in the empty spaces (dish cloths and towels work excellently). Create towers by stacking similar pots together, layering packing paper between each pot to prevent scratching. Place the towers on their sides in the box, remembering to fill in empty spaces with the void fill of your choice. Disconnect all wires and cords, grouping them together by device (make sure to label them!). There are plenty of options when it comes to keeping electronics secure, such as using bubble cushion or the original manufacturer’s box (if you kept it). Anti-static bubble cushion is an excellent choice if you’re worried about static build-up. Moving soon? Check out these handy checklists for making your move go smoother! Get instant access to our FREE Printable Moving Checklist For Home—and stay up-to-date on all the great content and products we have to offer! Get instant access to our FREE Printable Moving Checklist For University—and stay up-to-date on all the great content and products we have to offer! The 4 Ps of moving is all you’ll need to make your packing efforts go smoothly. If you’re looking for even more moving and packing tips, make sure to check our blog’s moving category. Happy packing!